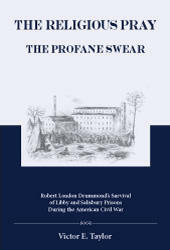 Title: The Religious Pray, The Profane Swear: Robert Loudon Drummond’s Survival of Libby and Salisbury Prisons During the American Civil War Author: Victor E. Taylor A PenMark Press book soft cover 180 pp. USD 20.00 ISBN 978-1888570458 December 2011 The Davies Group, Publishers The Religious Pray, The Profane Swear chronicles the wartime experiences of a profoundly religious man who suffered and survived two of the most notoriously inhumane and brutal Confederate prison camps during the winter and spring of 1864 and 1865. The book contains a biography of Robert L. Drummond that situates his religious perspective in the context of the Presbyterian Church’s internal debate over the issue of slavery. Additional chapters address, the religious dimensions of slavery at the time of the Civil War and the theological conflicts between Northern and Southern Christian communities regarding the widely held Southern view that American race slavery was biblically sanctioned. The Religious Pray, The Profane Swear contains speeches by Robert L. Drummond delivered after the War to commemorate the sacrifice made by Union soldiers at Salisbury Prison (1914) and the fiftieth anniversary of Battle of Gettysburg (1913) and private correspondences between Drummond and Miss Juliet Le Roy Mangum, the daughter of the Reverend Aldolphus W. Mangum, a minister assigned to Salisbury Prison whose first-hand account (1890), included in the book, was one of the very few credible accounts of the horrors of prison life in Salisbury prison. Contents List of Illustrations Foreword Acknowledgments Introduction Robert Loudon Drummond: A Brief Biography Of War and Reconciliation God Against God From Farm Field to Battle Field Address February 22, 1901: Personal Reminiscences of Prison Life During The War of The Rebellion Glossary Adolphus W. Mangum‘s “Salisbury Prison” Letter from Drummond to Miss Juliet Le Roy Mangum Drummond Oration July 3, 1913, Delivered at the reunion of the 111th New York Infantry Upon the Battle Field of Gettysburg Drummond Salisbury Address, 1914 Afterword Author Victor E. Taylor is the author of Para/Inquiry: Postmodern Religion and Culture (Routledge, 2000), Religion After Postmodernism: Retheorizing Myth and Literature (University of Virginia Press, 2008), and co-editor of Conversations in Cultural Rhetoric and Composition (Davies Group Publishers, 2009). He is the executive editor of The Journal for Cultural and Religious Theory and teaches in the English and Humanities Department at York College of Pennsylvania.